The role of the home theater receiver has changed significantly over the years. However, does that now mean that you are required to connect all your video source signals (such as VCR, DVD, Blu-ray Disc, Cable/Satellite, etc...) to your home theater receiver? The answer depends on the capabilities of your home theater receiver and how you want your home theater system organized. If you would rather — You can actually bypass the home theater receiver for routing video signals, and instead, connect the video signal source device directly to your TV or video projector. You can then make a second audio-only connection to your home theater receiver. However, there are are some practical reasons to route both your video and audio signals through a home theater receiver. One reason to route both audio and video through a home theater receiver is to cut down on cable clutter. When you are using a DVD player or Blu-ray Disc player in your setup that provides HDMI connections, and the receiver also has HDMI connections with the ability to access, decode, or process audio signals embedded in the HDMI signal, HDMI carries both audio and video signals. Thus, using a single cable, you simply connect the HDMI cable from your source component through your receiver for both audio and video using the one HDMI cable. Not only does HDMI provide desired access to both audio and video signals, but reduces your cable clutter between the receiver the source device, the receiver, and the TV, since all you need is one HDMI connection between the receiver and the TV or video projector, instead of having to connect a video cable from your source to the TV or video projector and also connect a separate audio cable to your home theater receiver. In a specific setup, it can be more convenient to send the video signal through the home theater receiver, as the receiver can control all the source switching for both audio and video. In other words, instead of having to switch the TV to proper video input that your video source component is connected to, and then also having to switch the receiver to the proper audio input, you can do it in one step if both video and audio are able to go through the home theater receiver. If you have a home theater receiver with built-in video processing and upscaling for lower resolution analog video signals, routing your video sources through the receiver can provide some advantages, as the processing and scaling features of many home theater receivers may be able to provide a cleaner video signal going to the TV than if you connected analog video source directly to the TV. If you own a 3D TV or video projector, just about all home theater receivers manufactured beginning in late 2010 going forward are 3D compatible. In other words, they can pass 3D video signals from a 3D source device to a 3D TV or video projector via HDMI ver 1.4a (or higher/more recent) connections. So, if your home theater complies with that standard, you can simply route 3D video and audio signals via a single HDMI cable through your receiver to a 3D TV or 3D video projector. On the other hand, if your home theater receiver does not provide 3D pass-through, you will have to connect the video signal from your 3D source (such as a 3D Blu-ray disc player ) to your TV or video projector directly, and then also make a separate audio connection to your non-3D compliant home theater receiver. Another thing to take into consideration with regards to passing video through a home theater receiver is 4K resolution video. Beginning in mid-2009, HDMI ver 1.4 was introduced which gave home theater receivers limited ability to pass-through 4K resolution video signals (up to 30fps), but the added introduction of HDMI ver 2.0 in 2013 enabled 4K pass-through capability for 60fps sources. However, it doesn't stop there. In 2015, the introduction of HDMI ver 2.0a added the ability for home theater receivers to pass HDR and Wide Color Gamut video signals. What all of the above "techie" stuff regarding 4K means for consumers is that just about all home theater receivers made beginning in 2016 incorporate HDMI ver2.0a (or higher). This means full compatibility for all aspects of 4K video signal pass-through. 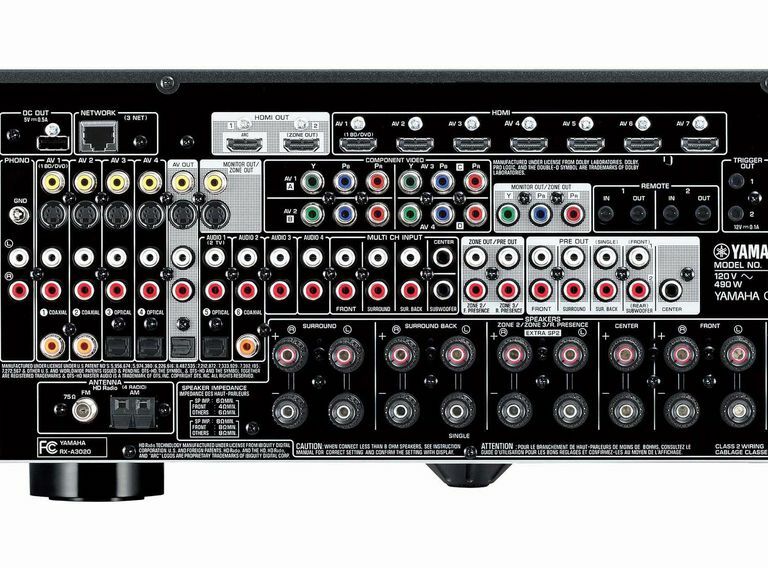 However, for those that purchased home theater receivers between 2010 and 2015, there are some compatibility variations. If you have a 4K Ultra HD TV, and 4K source components (such as a Blu-ray Disc player with 4K upscaling, Ultra HD Blu-ray Disc player, or 4K-capable media streamer) — consult your TV's, Home Theater Receiver, and source components' user manuals or online product support for information on their video capabilities. If your 4K Ultra HD TV and source component(s) are fully equipped with HDMI ver2.0a and your home theater receiver is not, check your source components to see if you can connect them directly to your TV for video and make a separate connection to your home theater receiver for audio. It is important to note that making a separate video and audio connection may also affect what audio formats your home theater receiver will have access to. For example, the Dolby TrueHD/Atmos and DTS-HD Master Audio/DTS:X surround sound formats can only be passed through HDMI. However, unlike 3D, even if your home theater receiver is not compatible with all aspects of the latest 4K Ultra HD specifications, it will pass-through those aspects that it is compatible with, so users will still see some benefit if you still want to connect your 4K video sources to a home theater receiver that is equipped with HDMI ver1.4. Whether you route both audio and video signals through a home theater receiver depends on what the capabilities of your TV, home theater receiver, Blu-ray Disc/DVD player or other components are, and what is most convenient for you. Decide how you want to organize the audio and video signal flow in your home theater setup and, if needed, purchase a home theater receiver that best fits your setup preferences.